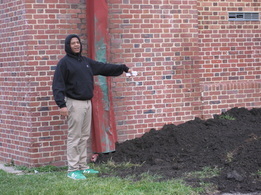 To plant the rain garden, we received a mini-grant from the Chesapeake Bay Trust. The students reviewed the supporting documentation to understand why we were creating this structure on their campus. They also looked at the plant list and researched some of the plants to understand what should be planted.